How to Wear a Striped T-shirt | KSISTYLE! Sea style is considered funny, simple, dynamic, nonconformist. At the same time it’s a classic of the genre, a timeless style. It involves the use of very functional things. No matter what trends prevail on the catwalks, it will always remain in fashion. The most typical representative of this style are t-shirts in stripes, like sailors. From year to year, fashion designers present their vision of the sea style to the public. Sometimes they let out striped dresses or sundress, sweaters and even business jackets in a strip. The thickness and color of the longitudinal rulers are also changing. For the first time striped t-shirt introduced the female fashion Coco Chanel. In 1917, at her company store in Deauville, France, women’s top appeared in blue and white stripes, like those of sailors. Since then they have never gone out of fashion. Women of the whole world adapted this classy, elegant, image. And fashion designers began to rethink it and offer completely unique, original models of clothes in the marine theme. 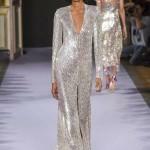 For many years it has been one of the most important trends in the fashion world. Even if you use t-shirts with original blue and white stripes, you can see other variations. Strips can be black, red, multi-colored. Designers sew clothes from such fabric not only in the form of t-shirt, but also in the form of shirts, tops, and other various styles. Some of them are even decorated with sequins or others. Even in this style direction there are some rules that should be taken into account, so that the style reflects your character and emphasizes the appearance. You can play with shades, accessories to create a unique image. Strips are a very specific pattern that make sea style clothes different from other. — Bright accents refresh the image and make it more original. 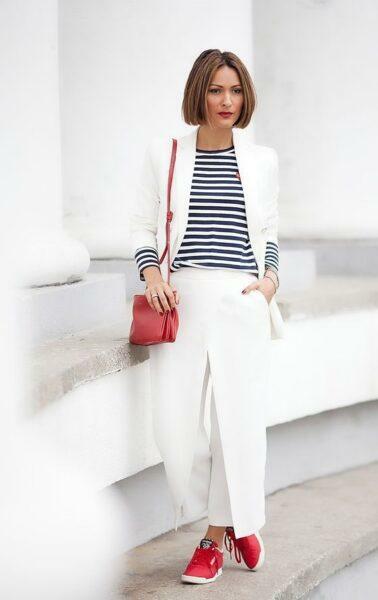 Add a little red to the white-blue ensemble. It can be bright shoes, handbag or scarf. — The advantage of the striped top is that you can choose any shoes. Sneakers or slip-on are suitable for travel. Shoes with flat soles or ballet shoes — for a female comfortable image. Platform shoes or sandals gladiator give a bit of courage. 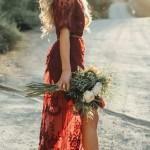 In sandals or shoes with heels, you can go on a date. — An ideal composition will be fashionable jeans and a t-shirt. Practical denim is perfectly combined with the striped top in color, style and mood. — You can use other trousers: white chinos, straight or short, narrowed or loose. Owners of slender legs for the summer have already prepared shorts. 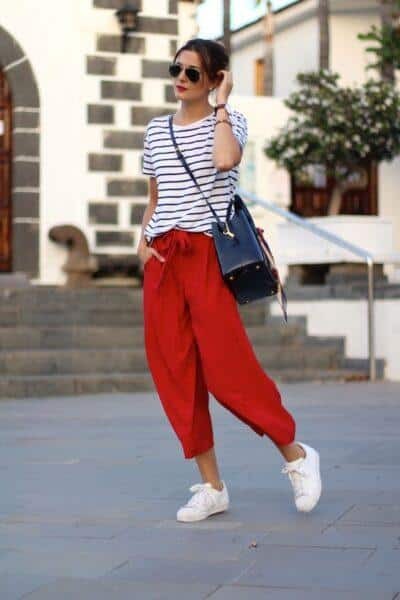 And stylish flared trousers will create an ideal image of a modern sailor girl, because that’s what the dream of all seafarers looks like! 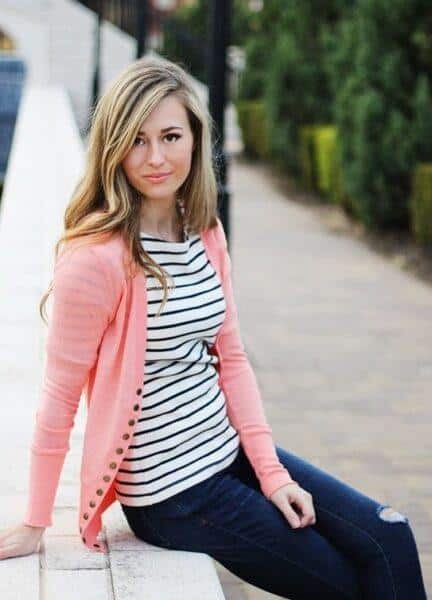 Beige cardigan perfectly fits to the striped top, as in the photo. 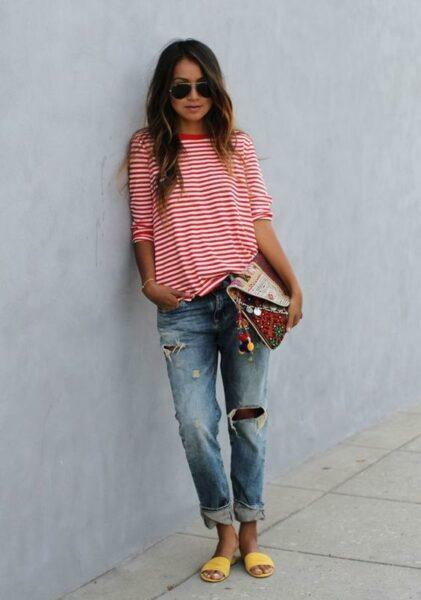 — Jeans or leather jackets with striped shirt will form a spring-autumn image. And if you add a stylish clutch of contrasting color, then this image can conquer the flawlessness of taste. — For the summer, wear light denim vests. And they are combined not only with it, but with a striped dress. — Do you think you can wear a shirt only frivolous skirt-bottoms? No, you can experiment with almost all the fashionable skirts this year. Fresh images make up with a gentle pleating, feminine midi, durable leather skirts, pencil skirt. — And how about combining different prints in one outfit? Fashion is not against it, especially if it’s a shirt in a cage. Tartan is called the main fashionable print of 2018, so it’s not surprising that attention to it. — Classic-looking stripe also fit well with leggings and narrow jeans. If you have a question, can I wear a striped T-shirt with loose trousers, then the designers answer in the affirmative! Look how beautifully look fashionable trousers-palazzo and T-shirt, the photo-image turned out to be truly stylish and modern! 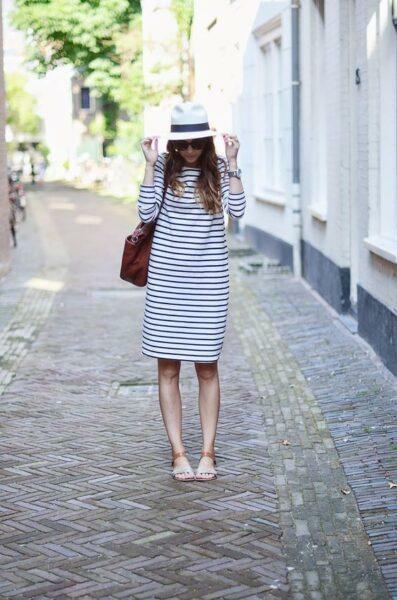 — Dress in stripes — the basis of the image in the marine style. 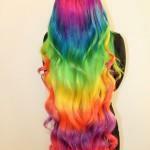 And let’s say that the vertical lines are complete, but our slender figure not to be afraid of this. Yes, and a laconic blue and white strip is unlikely to spoil the girl’s silhouette, especially if you choose a trendy midi style, an oversize dress or a laconic trapeze that hides a plump tummy. 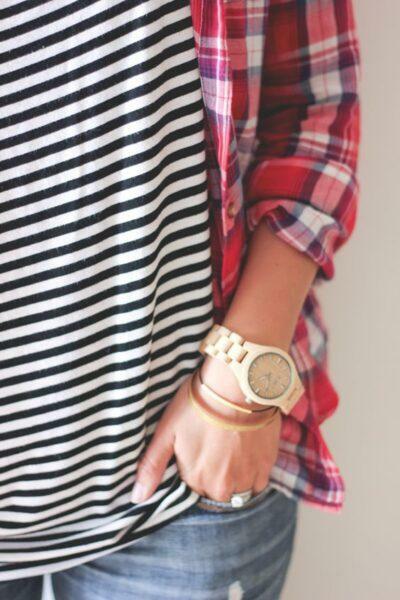 Striped shirt is the basis of the fashionable sea style. How to make outfits in other styles using this trend? - Rock. To go to a rock festival, you can wear a striped shirt with jeans shorts and sandals. If you add a bag that is worn over your shoulder, you will get an interesting image that is easy to apply for other events. — The style of «unisex». It means the use t-shirt with jeans or trousers, a hat is suitable for such an image. If the jeans have a darker shade and look slightly shabby, it will further accentuate the coloring of the style. - Romantic image. If you like feminine style, you can put chiffon skirt dark blue, pink or silver metallic color. It can be short or long. In any case, shoes with high heels and sunglasses in retro style. - Casual style. 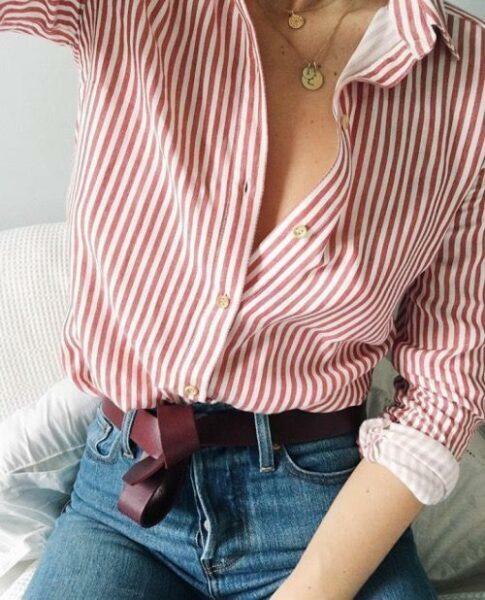 For the everyday image, you can use a red striped t-shirt. 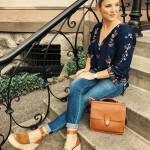 Do not forget to add a bag that is worn over your shoulder and comfortable shoes. Complement the t-shirt with a khaki jacket, jeans, culottes or shorts. The main thing is comfort and freedom of movement! Read the top 10 major questions about culottes in our new publication. - A classic image. If you want to create a chic, elegant style, use a pants, a t-shirt and a classic jacket. You can also wear white trousers. 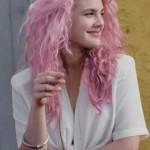 - Glamor style. Sea theme is appropriate for other variants of images. For example, you can wear a t-shirt with a pink blazer in a nightclub. To this combination, jeans and high-heeled shoes are suitable. For a more glamorous image, a striped dress is useful, which can be worn with sandals on a hairpin and a colored purse. 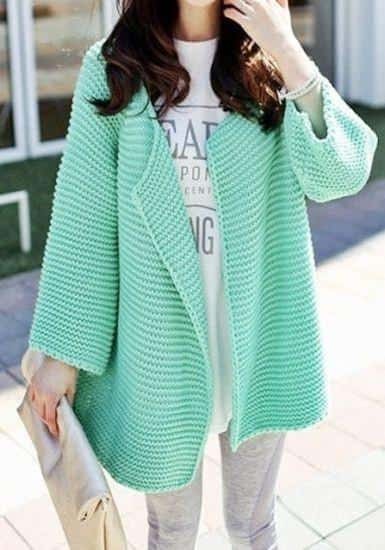 You can wear a striped T-shirt with a coral cardigan. — Do not be afraid to experiment and combine striped T-shirts with a variety of clothes, do not be afraid to be bright. Use different combinations, if you have the courage, try putting strip with variegated things. — In everyday life, try not to wear more than one subject of marine subjects at a time. Otherwise, get an image overloaded with details. Transformation into a seagirl is acceptable only on the coast of the ocean. By the way, when collecting clothes on the sea, do not forget about the striped trend. — The striped blouse goes well with white pants and skirts, sewn from lightweight fabrics. This is an excellent option for very hot days. — From accessories it is necessary to choose sunglasses and vintage handbag. If you like the glamorous style, you can add red lipstick here and bring your eyes in black pencil. — To improve the image wear hat and scarves, but choose accessories that contrast with stripe in color and print. - Supplement the image with pearls, because both these things unite belonging to the sea. The universality of the decoration lies in the fact that it is equally well combined with the evening dress, and with a striped T-shirt. Alternatively, choose other jewelry from natural materials: pendants with stones, chains, thin wooden beads. For recreation outside the city wear t-shirt with shorts and a pair of sandals on a flat sole. And if you want to achieve a sensual seductive look, wear top that lightly open your shoulders. More fashion images with a striped top look in the video.